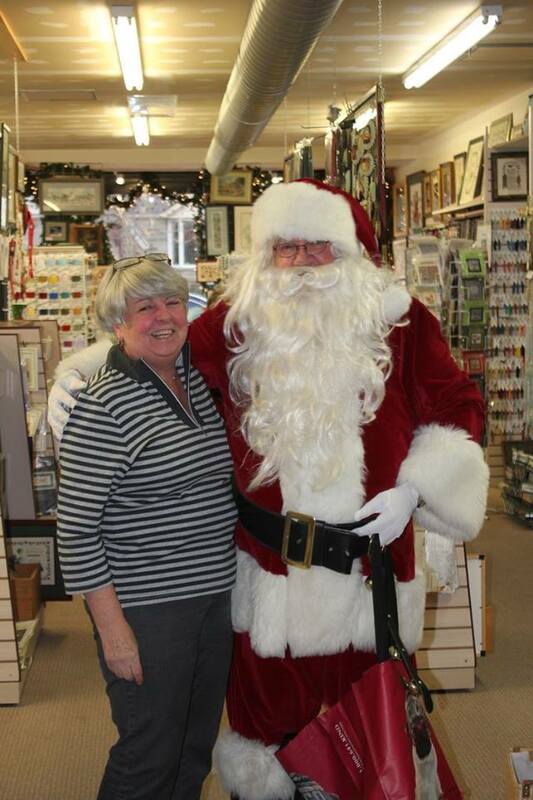 It's Christmas time, and once again Gitta's was all decked out for our Annual Christmas Open House. Even Gitta's elves were dressed for the festivities. and of course the gift of another Reindeer. For all of you unable to drop by the shop for all the happenings, we would like to share the pattern of this years Reindeer with you. Click here for the cover photo. Click here for page 1, and click here for page 2. Enjoy. love of stitching with all of you. 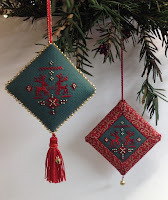 Wishing you all a festive Christmas Season with family and friends, and a wonderful New Year filled with peace, love, health, happiness, and many new stitching projects. Mark your calendars for next year's festivities, Saturday December 7th. As I sit here this evening, only 2 nights away from Christmas Eve, Gitta's Christmas Open House seems like so long ago. This month has been busier than usual in the shop, and as I leave my decorating and shopping for at home until after the Open House, my evenings and weekends have also been hectic. As, with every year, I feel this blog is most anticipated by both those that were able and those unable to join us for the Christmas Open House. Our Christmas Open House is always held on the 1st Saturday in December. And with the mild temperatures this year, a line was already forming while we were still finishing the final touches in the shop. From the time we opened our doors to the end of the day, the shop was filled with good friends and lots of Christmas cheer. The fabric table was the spot to be. At times, two of us needed to be cutting and one serging. And even my Dad had lots of company throughout the day in our Needlepoint corner. And then, just like that, it was all over. As in previous years, I had designed a Reindeer Ornament for the occasion. This year's design "Reindeer Sampler" was kitted, and this kit plus a few other designs was my Christmas gift to all those attending this year. I realize not everyone is able to drop by, whether it be other commitments or distance. For those of you, please click here for your copy of this year's Reindeer. From left to right, Kathrin, Barbara, Monika, Sarah, and Margaret. 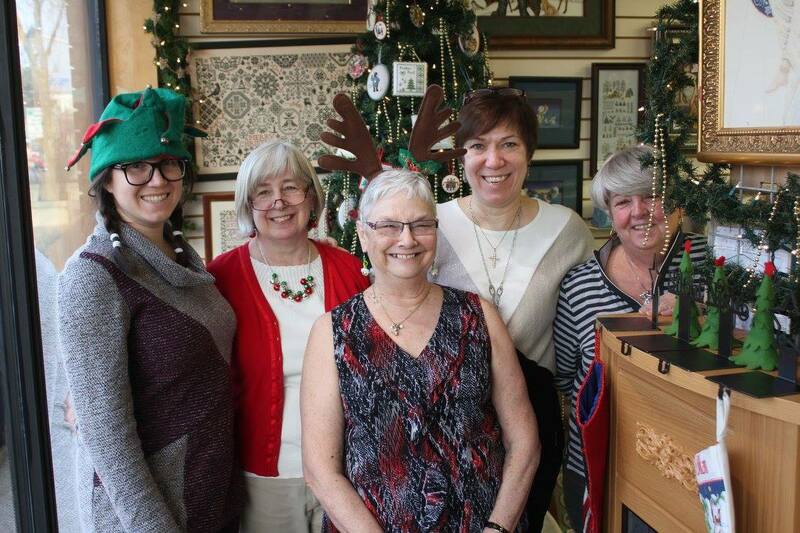 Carol was unable to be with us this year; she'll be back next year with her bells and reindeer antlers on. All of us would like to wish you a very Merry Christmas, and a fabulous New year, filled with everything that makes us happy, good health, good friends, and lots of stitching. I'm about to say something that is said by so many of us, and holds true, every year. "I can't believe a whole year has gone by already!" Having wanted to get back to my blog, I figured the new year would be a great time to start. However, before I do, there are some 2016 happenings, I wanted to share. This year, was a busy year for me, both personally and in the shop. My husband and I celebrated our 30th Wedding Anniversary in June; and Gitta's, likewise, celebrated it's 30th in October. I wish my mom could be here to enjoy her accomplishments, she would have been so proud and thrilled. I can remember thinking, many many years ago, when I started working at Bell Canada, that 25 years seemed so far far away. My co-worker had just celebrated 25 years of working at Bell, and to me that seemed like a lifetime away. Today, I feel, the past 30 years have flown by way too quickly. Here's hoping I will savour every moment of the next 30 years. As those of you having already seen the photos on facebook know, that my husband and I thought Hawaii would be the perfect place to celebrate our 30th Anniversary. We had a fabulous time. We walked along the beaches (white, black and green sand), climbed into volcano craters and lava tubes, saw a live volcano, watched the sunset at 13,800 ft on top of Mauna Kea (a dormant volcano), visited some tourist spots, shopped along Waikiki, snorkeled with sea turtles, ziplined over waterfalls, hiked along ridge trails, and body surfed (not very well). In October, we celebrated Gitta's 30th Anniversary. I can remember first opening our doors in a smaller shop just down the road. I remember thinking the shop looked a little bare, but after only 10 years we had outgrown that location and moved to the larger shop we are outgrowing today. The shop has been like my third child, yielding a wonderful extended family of stitching friends and customers. I have loved every minute, and could not think of anything else I would rather do. My dad is still a regular fixture in the shop, and was there to help with the Anniversary celebrations. 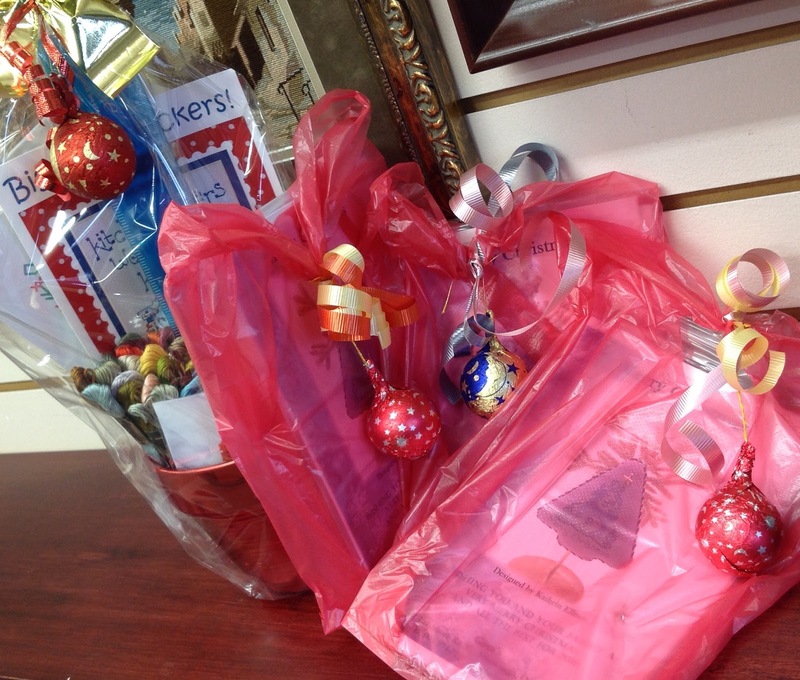 We had many wonderful donations from our suppliers, which we used for door prizes and gift bag stuffers. We ended the year with our Annual Christmas Open House. As always it was held on the first Saturday in December. We prepared gift bags for everyone, laid-out the snack table, had a sale on everything in the shop, and prizes were drawn at the end of the day. As I do every year I had also designed yet another reindeer, which we kitted as my gift to everyone that dropped by to partake in some Christmas Cheer. 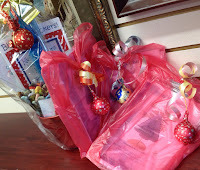 Knowing, not all of you are able to drop by the shop, I would also like to gift this year's Reindeer with all of you. With any luck Santa's reindeers will fly all around the world. I hope you all had a wonderful Christmas with family & friends. Wishing you all a fabulous New Year, filled with love, health, and happiness. What is Petit Point? is a question I get asked quite often. Probably, because when stitchers come into the shop to purchase 25ct Lugana, I question if it is for a Heaven and Earth design. Once affirmed, I usually ask "Why not petit point it, instead of cross stitching?" What's the difference? is then the usual response. 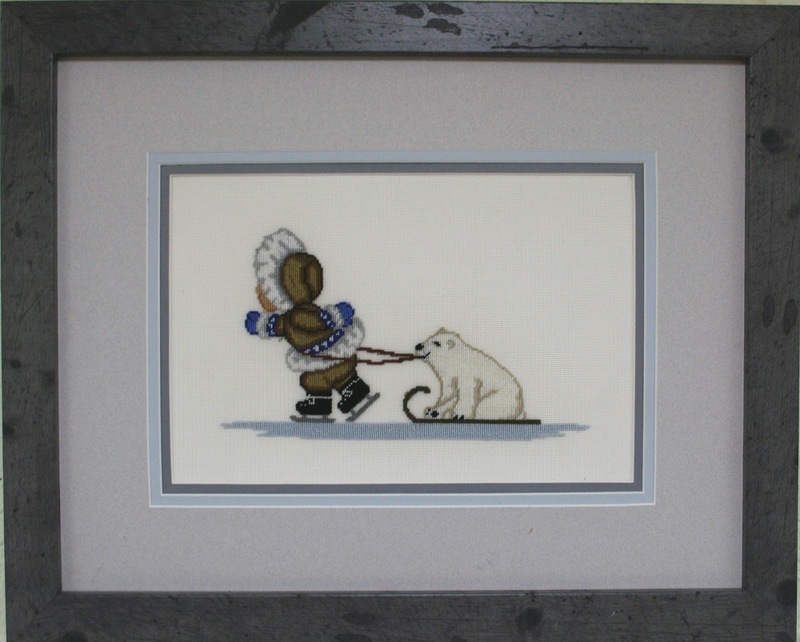 Petit point is stitched using the Continental or Tent Stitch. 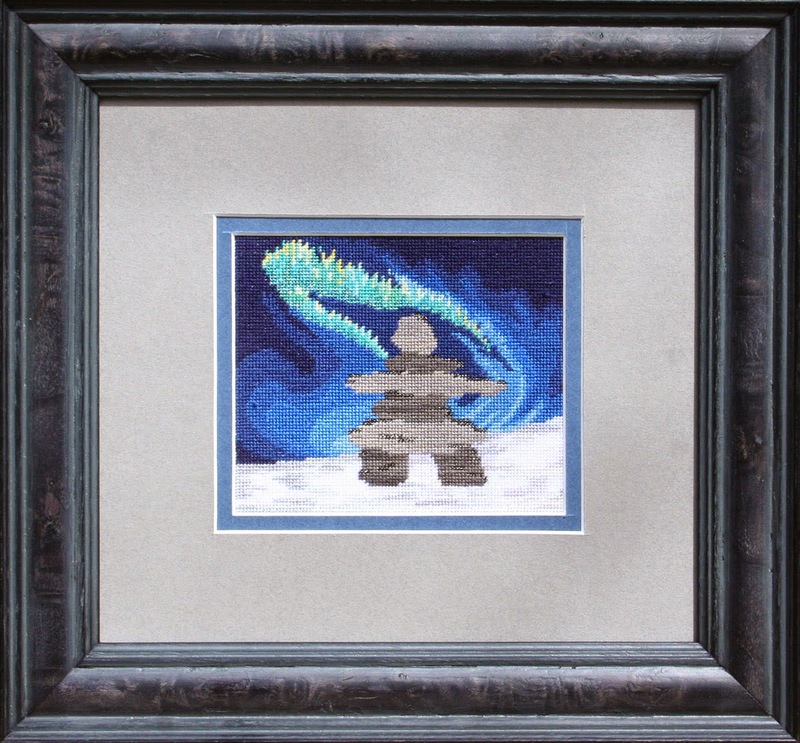 This is an angled stitch that is often mistakenly described as a Half Cross stitch. The Half Cross may look like the Continental stitch on the front, in that they are both angled up to the right, but on the back they are noticeably different. The Continental stitch is angled and the Cross stitch is vertical. For full stitch instructions please visit Free Stuff on Gitta's website. 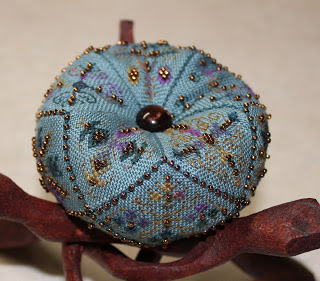 In this blog I want to talk about the differences between these two stitches and why all Petit Point designs can also be cross stitched, but not all Cross stitch designs, in my opinion, can be petit pointed. An ideal pattern to petit point is composed of only full stitches. 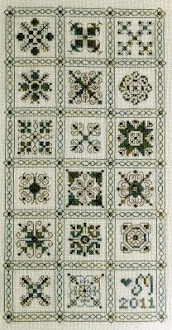 A continental stitch cannot be split, and thus a cross stitch pattern that has many 1/4 stitches and backstitches would be next to impossible to petit point. 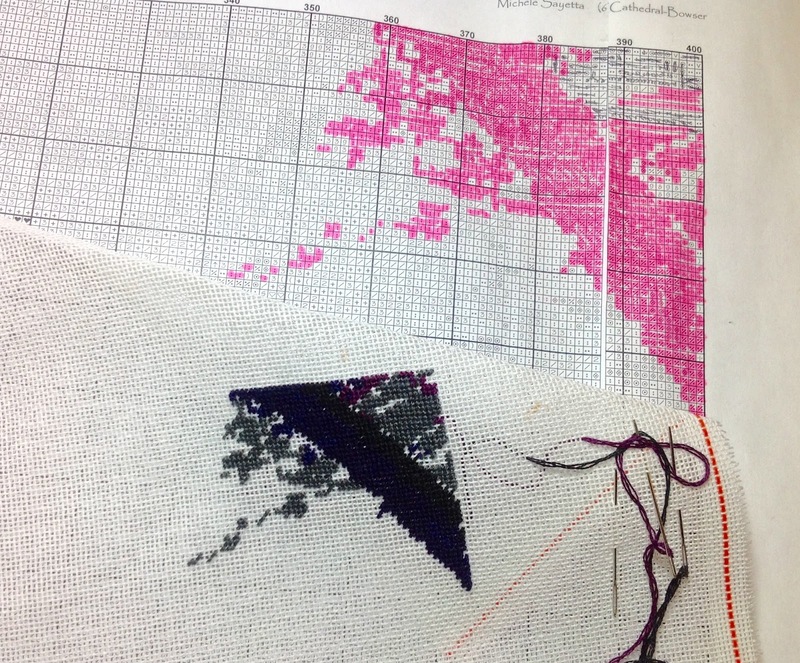 When two 1/4 stitches fill one square on a cross stitch chart, each represents a different thread colour. When petit pointing such a design, only one of these thread colours can be choosen. You can appreciate that if too many of these decisions have to be made the finished design will be altered. 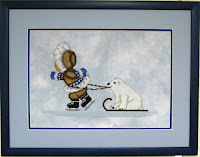 Cross stitch patterns also rely on backstitches to define the design. It's not until the backstitches are complete that the design comes to life. In contrast petit point designs rely on the subtle changes in colour to create depth and definition within the design. 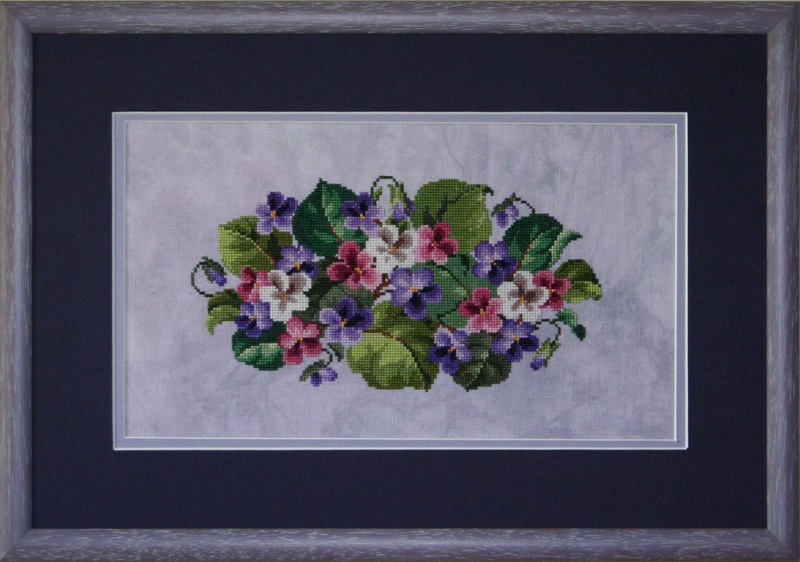 With Petit Point, the stitches completely cover the silk gauze or canvas. In contrast, with cross stitch the stitches do not completely cover the fabric and the fabric colour peeks through the stitches. The resulting difference is that the same threads will appear richer when petit pointed. Another noticeable difference is that a design will generally be smaller when petit pointed. This obviously is determined by the fabric count. 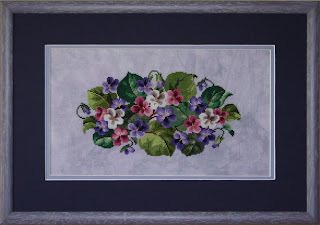 Although the continental stitch can be worked on many different canvas counts the most common is 22ct. canvas or 23ct. silk gauze. Whereas the most common count for cross stitch is 14 stitches/inch. The fewer the stitches per inch the larger the finished design size will be. 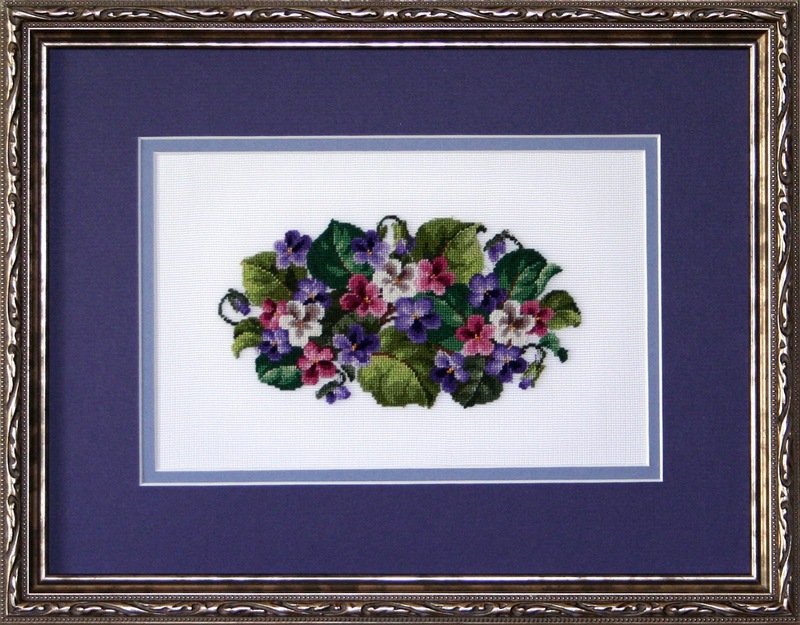 If you have never stitched a petit point, and want to give it a try, Gitta's has many small designs, mostly florals, available on our website. If petit point is not for you, don't discount Gitta's designs. 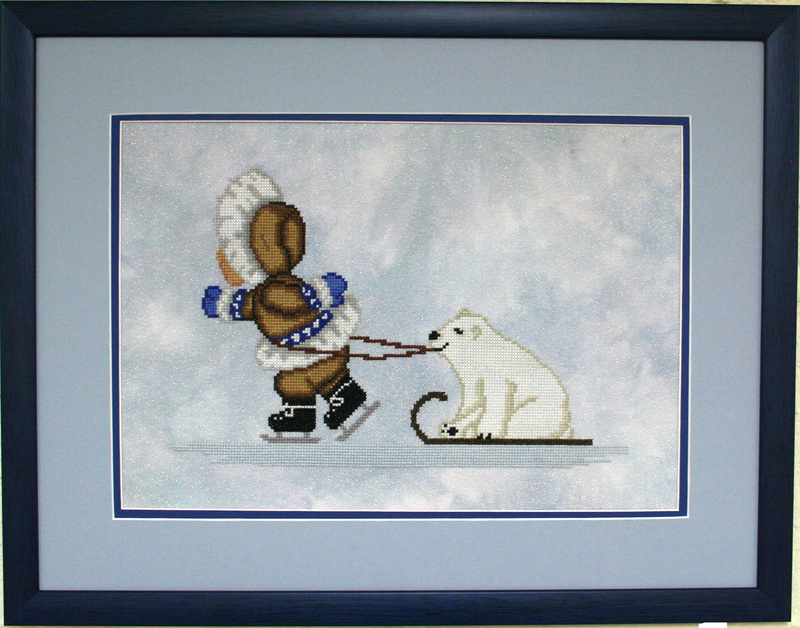 They also look great cross stitched, and they have no 1/4 stitches and no backstitches. 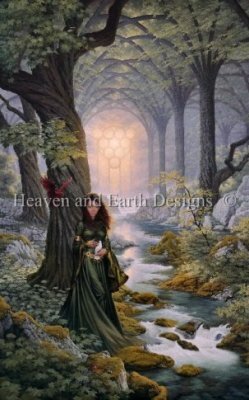 Heaven and Earth recommends to complete their designs page by page. This makes no sense to me on several levels. Practically - if the symbol you are following on one page continues onto the next, why end your thread only to later have to weave it in again. This will bulk up the back, and brings me to my second reason - Aesthetically. Depending on your tension and how you end your threads, stitching page by page, can create visible ridges that cannot be repaired. Stretching and framing will only make these more noticeable. These ridges are only created vertically, not horizontally. They are most noticeable in the darker and solid coloured areas. This is a photo of one of our Heaven & Earth models, The Forbidden Doorway. You can see a ridge in her skirt and another running down the door and through the stone steps. My suggestion to avoid these ridges is not to end your stitches along the sides of each page. As you get close to the edge of each page, tape the next page to it and follow each symbol across, or park your threads. Heaven & Earth also recommends to cross stitch on white 25ct Lugana. There is nothing wrong with this, but by no means is this the only fabric you can stitch a Heaven and Earth design on. Due to the large stitch count of these designs, the finished design size sounds smaller and thus more manageable than cross stitching it on 14, 16 and even 18 count aida. The amount of work is the same, only the finished design sizes vary. In actual fact, I find it easier and faster to stitch on aida than to cross stitch over one fabric thread on 25ct Lugana. Lugana is a woven fabric and if not careful, stitches can slip under at the cross over. Furthermore, cross stitching 1 over 1 on 25ct Lugana does not completely cover the fabric, this is very noticeable with darker thread colours. One way to avoid this is to reduce the contrast, choose a light to medium fabric colour. Another is to cross stitch on 18ct aida. Yes, the design will be larger, but 2 strands of floss give perfect coverage on 18ct aida. So, my recommendation is to draw from your own knowledge and cross stitch experience. Designers, and that includes yours truly, will make recommendations based on their own preferences and biases, but this does not make it gospel. Just remember..
1. The thread must go through the needle. 2. The needle must go through the fabric. Everything else is only a suggestion. We stitch because we love it, so enjoy. I had always wanted to petit point a Heaven & Earth design, but which one? They're all stunning, HUGE and require a great commitment of time. While perusing their website last November I finally found one that I could not resist, "Catherdral". It is 400 x 640 stitches, or 256,000 stitches in total. 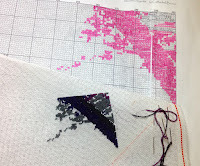 If I stitch one of the 10 x 10 squares (100 stitches) per day, then it will only take me 7 years to complete. No problem, right? Right! I figure I can petit point more than 100 stitches a night, so I should get it done in less than 7 years. I started as soon as I had the pattern in hand. This is as far as I got in 2 nights, but then with the Christmas rush I put it away for over the holidays. So maybe 7 years isn't far off the mark after all. To further complicate matters, I am starting all over. I first petit pointed on a 22 count canvas, using 3 strands of floss. I would have preferred to petit point using 2 strands of floss, but there is no finer count of canvas. Or at least that is what I had thought. I have since found a 25ct canvas, it's grided and 2 strands of floss give perfect coverage. So it's decided, I am starting over and this will become my new project for 2016. 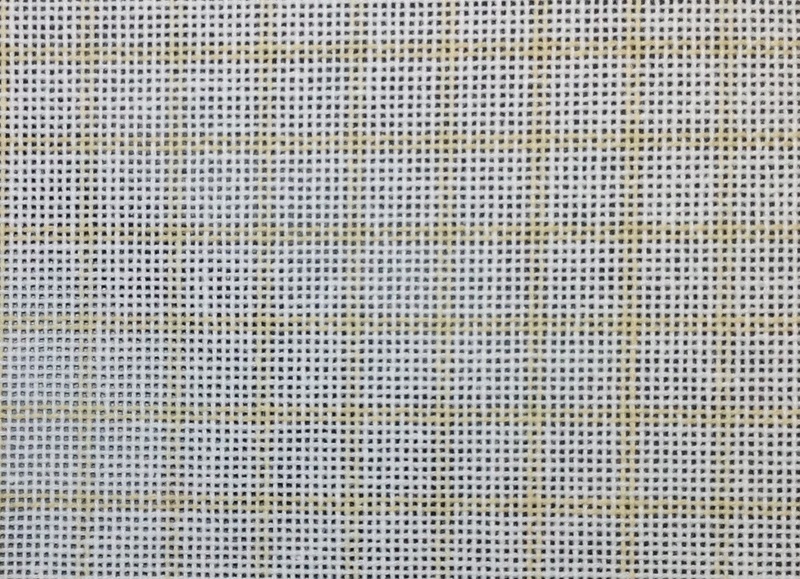 I'll post my progress every once in a while, and over the next month I'll post some general suggestions to consider when stitching these large computer generated charts published by companies such as Heaven & Earth, Mystic Stitch, and Scarlet Quince to name a few. If you have any questions or wish to share your experiences, please join the conversation by posting a comment. In hopes that our customers soon would be there. I looked out to see just what was the matter. Many of our customers loving this year's gifted reindeer. Through the shop they all wandered, looking along our fibre wall. Shop away, shop away, shop away all! With their baskets full of treasures, and patterns anew. Through the door St. Nicholas came with a bound. And his clothes were not tarnished with ashes and soot. He hugged all the ladies, mingled, and then made his tracks. And Monika laughed when she saw him, in spite of herself! And away he flew like the down of a thistle. it is a wonderful opportunity for us to say Thank You, to our customers. we are grateful for your support and friendship. years Open House please click here. filled with love, laughter, health and happiness. I have been a petit pointer all my life, or rather since the age of 11. 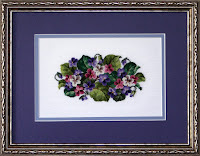 Today, I engage in all kinds of stitching techniques and design for petit point under the Gitta's Designs label. 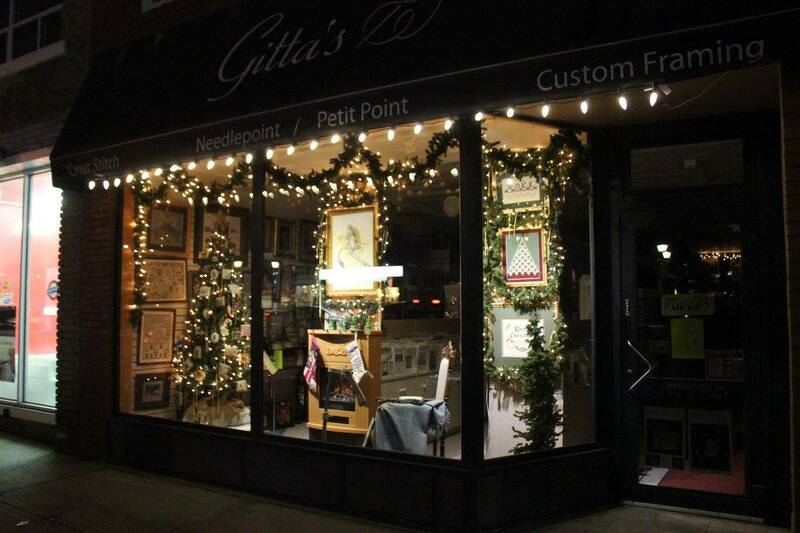 With my mother I also run a fully stocked stitching shop, Gitta's, located in Port Credit (Mississauga), Ontario, Canada. Gitta's is your one stop stitching shop! Carrying hundreds of designs and supplies for cross stitch, petit point and needlpoint. This SAL began with my August 3rd, 2012 post and ended with my December 14th, 2012 post. Follow up posts were January 19th, 2013, February 21, 2013 for the 16th final (Initial) square, and March 15th, 2013. This SAL began with my January 8th 2011 post and ended with the finishing instructions on my March 18th, 2011 post. All of the April 2011 posts then added 3 extra squares and instructions to turn this 15 Sided Biscornu into an 18 Square Sampler.